Typewriter in a park? Just add the word hipster, and you apparently have instant comedy. Anyway, that ‘meme’ has been cycling about on the knuckle-dragger interwebs for a while now, and let’s face it – it is pretty insulting to the guy photographed. I mean, like…. 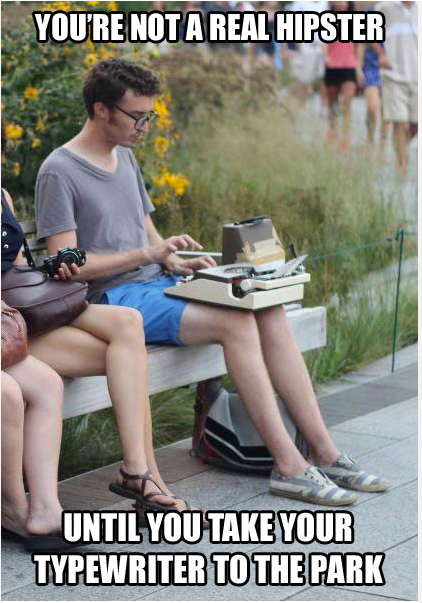 seriously… who takes a typewriter to a park anyway, right? It is 50 shades of weird to anyone that hasn’t done anything interesting in their life, other than fly to Bangkok at huge expense in order to spend the entire trip getting drunk in a bar or pub just like one at home. For some reason I have an urge to put a label on anyone that labels someone as a hipster for using a typewriter – or something similar. ‘Dipster’ perhaps? Well it turns out that there’s actually quite a compelling and interest story behind this typist. As I read it I felt sympathetic for him, not just as another typist, but as a person. He’d gone out and actually done something interesting. He went and did something different to the expectations of his family and friends, and actually created something. The fact that he created something that was positive and interesting, yet was belittled by keyboard commandos world wide that had dull and uninteresting lives lived in a perpetual cycle of doing the same dull lifeless routine that saw them lashing out at the rest of the world that wasn’t trapped in the same hole, made me feel inspired. It just reminds me about something Teeritz was talking about the other day – the utter dross of reality TV that people glue their social lives to here in Audtralia at the moment. It pretends to be art, but there’s no art to it. There’s no spontaneity. It is a performance, but it is a predictable performance. Congratulations to this guy for getting himself out of his lounge room and doing something. I think I can speak on behalf of the typosphere here, when I say – we salute you. December 3, 2013 in hipster, typewriter, Typosphere. ← Because it’s ‘Ebay Rare’. Living in western Washington, just about every third 20 year old is a hipster. It's kinda weird. None of them have typewriters. Yet. That photo is familiar though I can't remember whether I saw it with or without the caption. Either way, I hope that Mr Hermelin gets more on-street recognition for his work than he did before. I don't really understand about hipsterism. It isn't a label one can put on oneself, it con only be conferred, I think. Cool, on the other hand is a quality which can, and has been, thoroughly defined. Typing or writing in public or private doesn't make you cool or uncool. You either have cool or you don't. The thing is, people who have cool (or 'are' cool, if you prefer) have a proclivity for independent thoughts and activities. Thus they are more likely to type than the uncool. Attracting derision or praise doesn't really affect a cool person in their thoughts, their actions or their cool. That's the great thing about cool. After reading through Hermelin's piece I had two thoughts. One was that he is a very good writer; his text has such a comfortable and ungimicky flow that you barely realize that. The other is the astonishment at the number of people who are so dissatisfied with themselves that they need to find some sort of solace by whittling down others. OK, three things; the realization that the anonymous distance of internet interaction removes a layer of culturally-imposed morality; the filter that tends to keep us civilized in face-to-face interactions. You can't always use the computer, sometimes there isn't a currant bush nearby. You know.. I have yet to actually come across a hipster with a typewriter. Sure, Ive had some show interest in my collection, but no ownership. I'm sure he would be. He seems to enjoy a good natter on twitter and looks like a genuinely engaging guy. Mind you, that trailer seemed a bit pretentious. I feel sad that we as humans so often just line up others for derision. It is great to hear that something enjoyable outside of that negative spread across Facebook and the like is happening. Elegant point. To be honest, I don't think this guy is 'cool', and as such isn't a hipster. But I do find what he is doing interesting and engaging, and in its own way 'cool'. Mind you, I tweeted this blog at him, and he tweeted back. So he's really… just a guy with a typewriter. Like us. Agreed on both counts. It is sad to see so much self-dissatisfaction with the world. On the third, the relative anonymity (and it isn't as anonymous as people like to believe it is) is too often used as a shield. If people are going to use that shield, they do it out of fear of engaging in the world. Ha ha ha ha. I'll have to take a leaf out of your book someday. I'm not a hipster, I'm a creative person, have been known to write in public, and I have an old typewriter, which I love. I think this is the type of thing that genuinely appeals to some creative people – whether writers or artists. Therefore hipsters, as creative individual wannabees (all somehow fitting the same mold, and therefore not individuals at all!) might pick up on it. In the end, the genuine creative wins. By the time the carbon copy “alternative” masses have caught on to what they're up to, they are on to their next endeavor.